For as long as I can remember cherries have been one of my favorite fruits. My grandparents had a cherry tree in their orchard and we would pick buckets of them as a family every year. There are so many wonderful and delicious things you can make with cherries from drinks to desserts! It's also one of my favorite flavors! My children also love cherries - fresh, canned, dried or in a jar - they love them all. 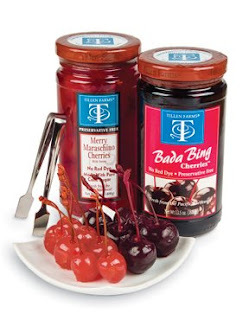 Maraschino cherries are their absolute favorite! They love them straight out of the jar, on top of ice cream, on top of pancakes and in their drinks! Tillen Farms cherries that are hand-packed at the absolute peak of freshness for maximum flavor. They have the perfect color, firmness and texture. They are sweet and absolutely delicious! From cupcakes to cheesecake and pineapple upside down cake to Shirley Temple's... cherries are the perfect topping for almost anything sweet! TIP: For best results, chill prior to serving! From now through 12/15/11, Tillen Farms is offering my wonderful readers 25% off your entire purchase. Simply use code TFCM2 at checkout! 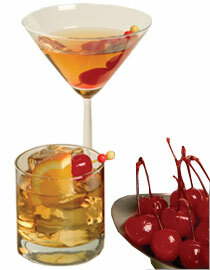 Can you believe a Maraschino Cherry made with natural ingredients? Tillen Farms brings back the peace of mind and great taste you want from your cherries WITHOUT using artificial colors, artificial flavors, sulfites and preservatives! Now you can bring new enjoyment to a Tom Collins, Manhattan, Shirley Temple and especially your ice cream sundae! it off with a Tillen Farms Maraschino Cherry! Finally, a maraschino cherry not just for decoration but one that you can actually enjoy eating! No Artificial Colors, Dyes or Flavors, Ever! Ingredients: Cherries, water, sugar, vegetable and fruit concentrate (color), natural flavor. Bing Cherries are loved for their natural sweetness, huge size and taste, but have only been available during a short growing season, until now! 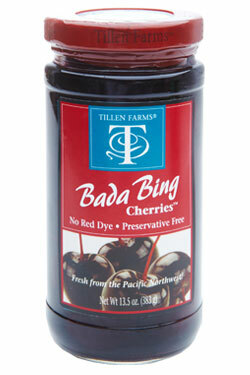 Tillen Farms' Bada Bing Cherries™ are carefully selected and harvested in the Pacific Northwest, the leading cherry growing region in the USA. Using only natural ingredients, just like with Tillen Farms' Merry Maraschino Cherries, they contain no preservatives, red dyes or corn syrup and are pitted and packed with stems on, for year round enjoyment! The great, sweet taste of Bing cherries, made only with natural ingredients, for desserts, cocktails or just for snacking, whenever your customers crave them... only from Tillen Farms. Ingredients: Bing cherries, water, sugar, vegetable and fruit concentrate (color), malic acid, citric acid and natural flavors. Tim and Helen Metzger have created Tillen Farms to continue a delicious tradition first begun by the Hogue family over forty years ago in the fertile, volcanic soil of the Yakima Valley of Washington State. From this rich soil, irrigated by pure river water running down the Cascade Mountains, come some of America's finest fruits and vegetables. The crispy white asparagus sounds great. I would try the sweet bell peppers. I would love to try the crispy carrots! PS - Your link to Tillen Farms in the rafflecopter form is not working!! I would love to try the crispy dilly beans. my grandma used to home can dilly beans. yum! I'd like to try the sweet bell peppers. I'd like to try the crispy carrots. I would love to try the Sunnyside Tomatoes or the Crispy White Asparagus! I would like to try the crispy asparagus. Hot and Spicy Crispy Asparagus! YUM!